"Remind me to send your head to the cleaners with the rest of the flatwork." Anchor Bay's second Stooges disc bears a somewhat misleading title; there are no "all time favorite" Stooges films to be found here. There is some worthwhile material, however. The packaging is also somewhat misleading, since Curly Howard is prominently featured all over the case and the disc, but he's barely present in the programming. The first program, Family Album, is a 1998 documentary (27m:27s) recounting the lives and careers of all six of the Stooges. It's far too short to be satisfying and only manages to hit some of the high points. There are plenty of bits of home movie footage that's interesting to see, and snippets from the four public domain shorts found on the other Anchor Bay disc make up much of the rest of the running time. They look far better here than they do on that disc, though. A short (15m:49s) program on the 1998 Stooges convention is up next; it's mildly interesting to see the relatives of the Stooges, but they don't recount any tales, and the whole thing is eminently forgettable. The high point of the disc, and the one thing making it worth a purchase, is the 1949 television pilot, Jerks of All Trades. Produced by Phil Berle, the late Milton Berle's brother, this would have put them in the forefront of television had the pilot been picked up. For reasons that are unclear, ABC did not pick up the series, and the Stooges returned to making shorts for Columbia for a pittance. That's really tragic, because the Stooges were perfect for the small screen, as evinced by the enormous success these shorts had when licensed to television in the late 1950s. Shot live in front of an audience, Moe, Larry and Shemp demonstrate their impeccable timing on a sustained basis that is truly impressive. While much of their studio output relies on editing and effects to some extent, their talent is shown to be absolutely genuine here. The premise was that the Stooges, as usual for the shorts, would take on a different job every week, and they begin as interior decorators. Their victim is common Stooge foil Emil Sitka, and they work together like a well-oiled machine. Joseph Kearns as a whiny pressure cooker salesman from Punxsutawney, PA is another highlight of the show. Riotously funny, this pilot can proudly take its place amongst the funniest of the shorts featuring Shemp. The package wraps up with the 1970 pilot Kook's Tour (53m:33s), a projected travelogue featuring Moe, Larry, Curly Joe DeRita and a black labrador retriever, Moose, as they toured the world. The first episode takes the retired Stooges to Idaho and Wyoming, where they visit Yellowstone, the Snake River and Jackson Hole. Heavily leaning toward fishing, the program is far too long and full of uninspired tomfoolery. Too old for the violence that made them earlier in their careers, they're reduced to just grousing at each other. The result is that the dog upstages them for much of the program. There are a few humorous moments involving pedalboats and Curly Joe's obsession with litterbugs, but it's really more sad than entertaining. Larry suffered a stroke that brought an end to the group during the filming, but the double work that was used to complete the film is pretty much invisible. Image Transfer Review: The family album and convention sequences look fine. Jerks is taken from the only surviving kinescope, and it really looks quite good for a kinescope, with decent detail though lacking a bit in black levels. Kook's Tour was shot on 16mm film, but that seems to no longer exist; the source material here is Super 8mm films marketed in the 1970s. Some spots have faded to red, but for the most part the picture is pretty good considering the source, with some very good color at times. Audio Transfer Review: Again, the 1998 segments sound fine. The 1949 pilot sounds not bad at all for live television, with some expected hiss and noise. The 1970 pilot also lacks a good soundtrack, suffering from a very tinny and thin sound. But again, considering the only surviving source materials, one can't complain too much. Extras Review: No extras are included (unless one counts the convention footage). Chaptering is generally adequate, except that Jerks has no chapters, par for the course in Stooges material. 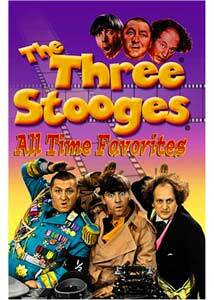 This Stooge disc is rather a mixed bag. The one thing that makes this worth more than a rental for the curious is the 1949 TV pilot, which is among their best work. The quality is about as good as can be expected from a kinescope.